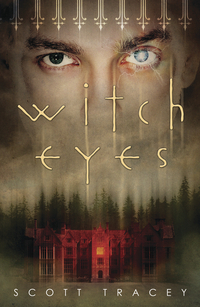 If you're looking for something different, exciting, and very well written in a YA paranormal novel, then Witch Eyes is it. I blew through Witch Eyes in one night! Once I started it, I just couldn't stop. It's a relatively short novel, but it packs quite a punch. From the very beginning, the action is non-stop, and it never once lets up. Normally, when we think of witches, our mind immediately jumps the conclusion that it's a girl. The great part about Witch Eyes is that it's a male protagonist. I haven't read many books where the narrator is male, so it was fun to read something out of the box. I liked Braden, although I felt like in the beginning he made a stupid decision. But he makes up for it as the novel unfolds and the mystery gets murkier. Even happens pretty quickly, which is both a good and bad thing. Good because, well, it's action-y. Bad because I wanted more of Braden and Trey! I wouldn't call them an official couple quite yet, but they have strong feelings for each other, and I wanted to see more of the build up. Still, the ending killed me. They need to be together! Trey is a great guy, his heritage aside. I hope they can find a way to make it work! I whole-heartedly recommend Witch Eyes! Loved it! 5 out of 5 stars. Ahh killer ending, male narrator, WITCHES, graet chemistry and mystery? Damn, why isn't this being released in Australia?? Definitely going to have to get my hands on this on online, it sounds fantastic! So happy you loved it. Awesome review!